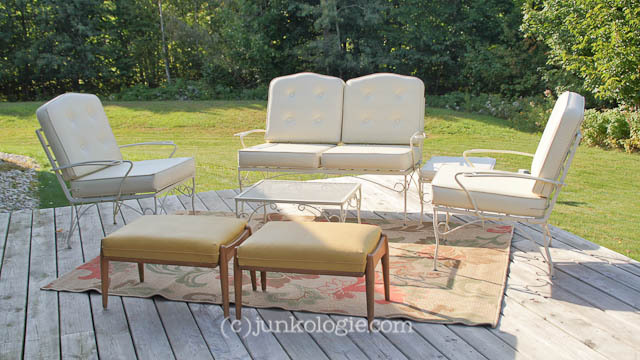 When I last left you on Monday with my wicked mad list of recent junk finds, I teased you a bit with this empty blah-ness that is corner of our large back deck. 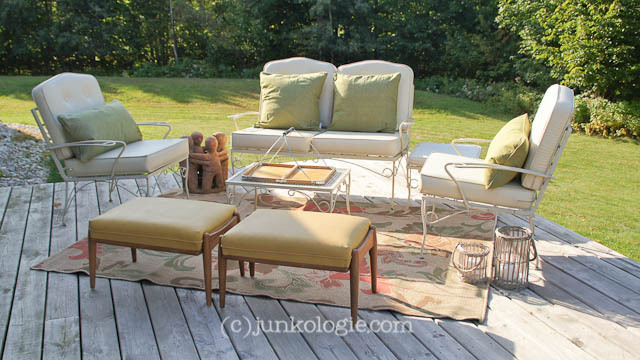 I've had various outdoor furniture here over the years, but nothing ever seems to work. So I decided to clear it off and wait for the universe to present me with a great solution. The answer came in a fun and unexpected way. On my way to an auction recently, I saw a sign for a garage sale right off the main road. I cruised on in and saw some patio furniture off to the side of the driveway. I was sure it was already sold because it wasn't displayed well. 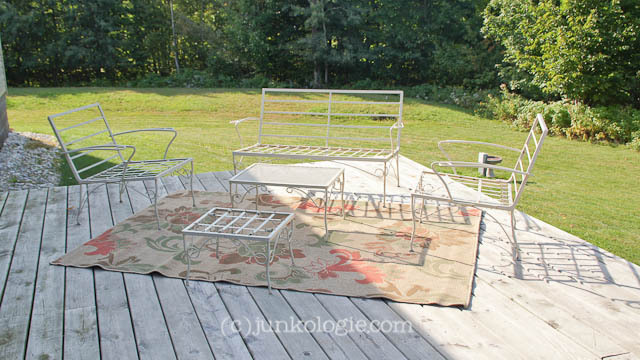 A vintage iron loveseat, pair of chairs, footstool, and coffee table with all cushions in tact. The joy at finding quality vintage pieces that don't need major repair or cushion replacement: Priceless! 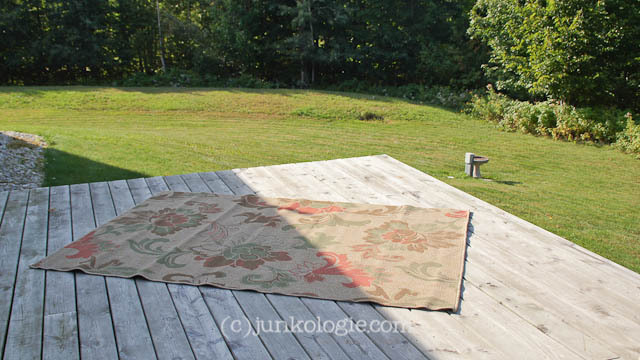 I started by creating a foundation with a Target outdoor rug found at Goodwill last summer. Perfect fall colors, don't you think? 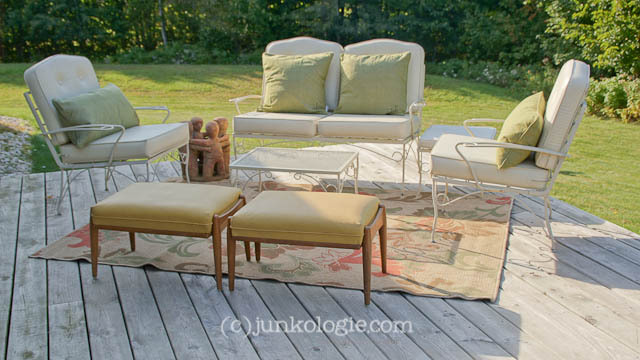 I added the patio furniture and decided to see how Heywood, Jr. and Wakefield, Jr. (recent auction finds) played in the mix with their harvest gold coloring. Add in a few pillows (above) and a then a few accessories (below). 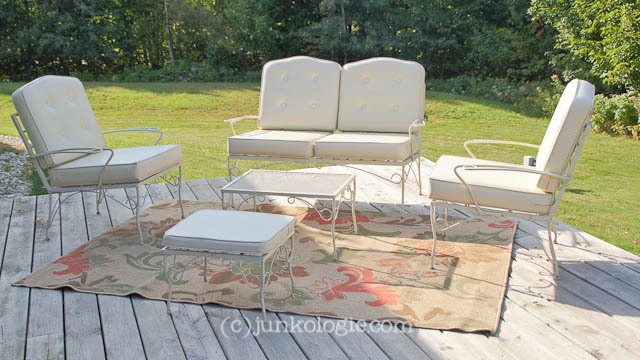 I think it makes for a happy and comfortable outdoor space. The upholstery on the cushions is a creamy white vinyl on most sides and a floral patterns with touches of blue, pink and green on one panel. 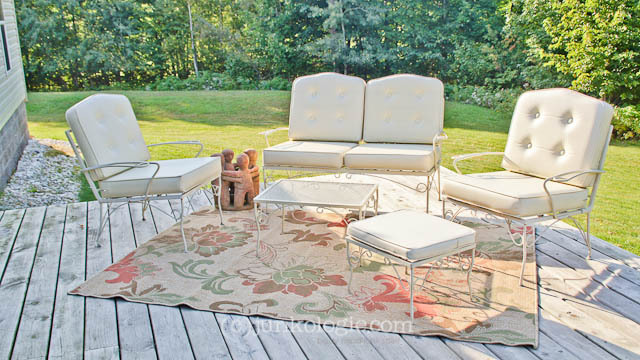 4 ideas for fall outdoor entertaining! 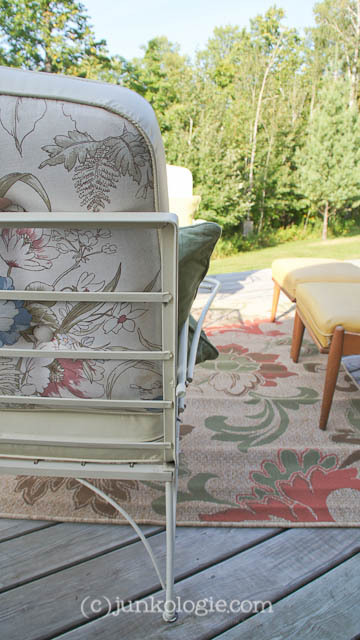 6 more ideas for fall outdoor entertaining! I don't recall actually doing any entertaining, but at least I was ready. With the new patio set, I have actually spent some time outside reading and/or enjoying the peace and quiet. As the weather changes and the leaves don their fall colors, I'll be able to cuddle up with a blanket and enjoy the autumn breezes that whisper through the woods here at WhisperWood Cottage. Bring on the autumn! Well that was an awesome deal! It looks fresh but ready for fall. The rug looks great. As it gets cooler, you can layer it all up. Looks great, Amy! What a fabulous deal you found in that patio furniture! 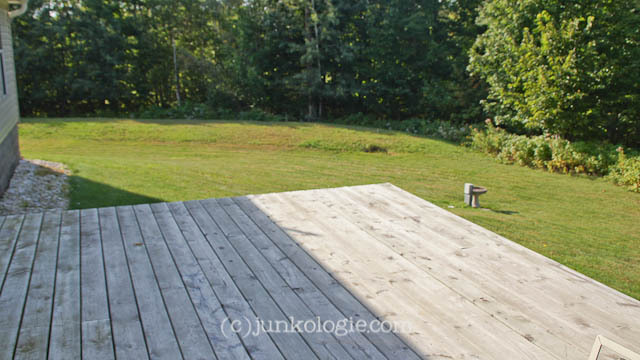 I'm sure you're going to really enjoy your back deck now. Fantastic!! You scored big time, but you also did a beautiful job pulling it all together to create a warm and envying space. Well done! Great finds! Love your patio and everything on it. Hope you are doing well, Amy. Not so blank anymore! Looks wonderful. I love your patio. Great find on the furniture. Lovely seeing it grow like that! I hope you'll do lots of entertaining there this year. Okay! I picked my spot! If you see me loitering on your back deck - don't think anything about it. Score! At $40 it would have been hard for me not to skip down the driveway! Holy cow that was cheap! They are in great shape. Are you going to leave the two Jr's outside? Will they be okay? Look at me, worrying about some footstools.